MIAMI COUNTY — An Ansonia woman entered a guilty plea to two felony charges for bringing drugs into the Miami County Jail and breaking and entering charges during a crime spree last December. Public defense attorney Steve Lehman requested an own recognizance bond for Brumbaugh. Brumbaugh stated she would reside with her mother in Piqua or seek housing with the Miami House and begin to participate in group therapy, get an assessment at the Miami County Recovery Council and attend NA/AA meetings while on bond. Miami County Assistant Prosecutor Paul Watkins opposed the bond, noting Brumbaugh failed to appear for a pre-trial conference last October and then proceeded to commit the offenses until she was arrested in December. Judge Pratt ordered a bond check at both residences and would make a written decision. 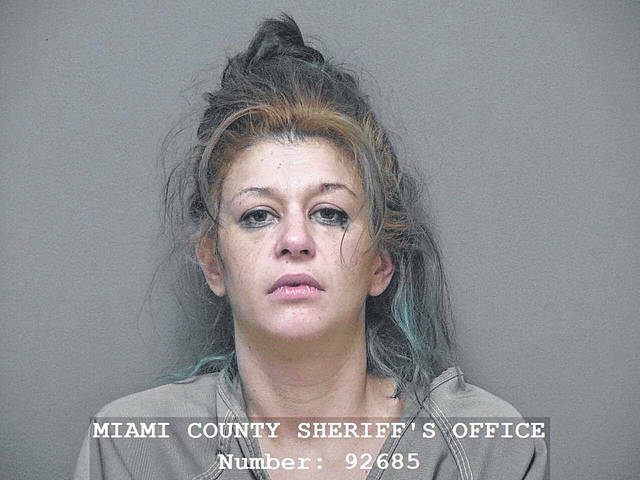 The Miami County Sheriff’s Office charged Brumbaugh after she reportedly brought the drugs into the Miami County Jail on Dec. 28. A crystalline substance suspected of being methamphetamine, a white powder substance suspected of being cocaine and pills suspected of being Xanax were found on Brumbaugh during a pat-down, according to the Miami County Sheriff’s Office report. McReynolds reportedly fled from Miami County Sheriff’s Office deputies on Dec. 23 and later on Dec. 27. McReynolds and Brumbaugh were discovered on the 4900 block of U.S. Route 36 in Washington Township in a stolen pick-up truck at approximately 10:50 p.m. Dec. 27, according to previous sheriff’s office reports. The vehicle fled from deputies, and the occupants abandoned the vehicle on the 5500 block of Buckneck Road when it became stuck in a muddy field. Brumbaugh was taken into custody after that incident. She was incarcerated on active warrants, including for fifth-degree felony aggravated possession of drugs, second-degree misdemeanor criminal damaging and fourth-degree misdemeanor criminal trespass. McReynolds is facing charges of fourth-degree felony trafficking in drugs, fifth-degree felony drug possession, first-degree misdemeanor failure to comply with a police officer, first-degree misdemeanor OVI, second-degree misdemeanor possession of a drug abuse instrument and fourth-degree misdemeanor possession of drug paraphernalia. McReynolds also faces traffic violations. This entry was tagged Ansonia, Breaking and entering, Cocaine, Common Pleas Court, court, drugs, felony, jail, Meth, Methamphetamine, Miami County, Miami County Common Pleas Court, Miami County Jail, Miami County Sheriff’s Office, Piqua, Theft, Xanax. Bookmark the permalink.